Mr Knight has been here again. He came on this. departing, rather rapidly, from both my house and the photograph. 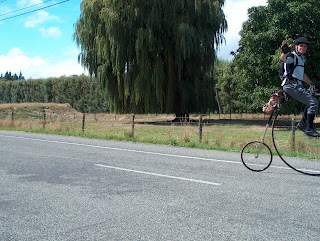 Mr Willan makes penny farthings. He makes them so accurately that he has to engrave each component with his name lest they are mistaken by enthusiastic auctioneers for originals. 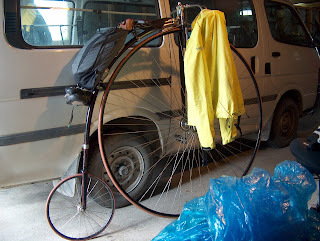 Mr Willan's penny farthings are works of utter craftsmanship and as soon as I heard he was coming I hid my penny farthing in the deepest recesses of the garage. I built my penny farthing. It is as bad as all the other things I build. It doesn't have a Trigwell Ball Bearing Head; it has a Sawn-off Shopper From Sileby Dump Head, and instead of an Arab Cradle Spring it's got a seat I found, inexplicably, in a hole in the road in Berlin one day. 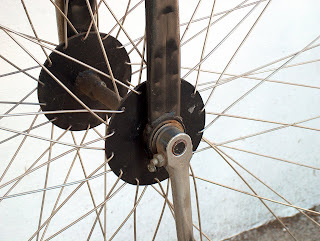 I copied the spoking from one I saw in Berlin Transport Museum, in a moment's inattention to the German road pothole situation, where each spoke doubles upon itself in the flange and so is actually two spokes at once. It's a cunning and simple way of spoking a penny but overnight each spoke transmits tension to its partner and you come out in the morning to find a four foot potato crisp sitting on the Workmate. Took me two weeks to true my wheel. Even now it's half an inch out of round and three-eighths out sideways. I forgive it, though, because Mike West in York took it off another machine and said 'Nobody'll ever ride this rim again' because it had been rewelded in at least two places. Now I'll let you into a little secret. Whenever I show it to elderly engineers, county archivists or the mountain-bike-riding wives of social workers, they all exclaim smugly 'Oh! An Ordinary!' just to show that they've read up on bicycle history. Well, no. 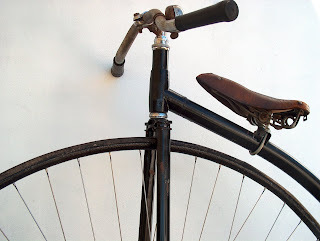 Every single person I know who's actually got one of these bicycles calls it - and this is not what dementing engineers archivists or worthy bespectacled wives think - a penny farthing.